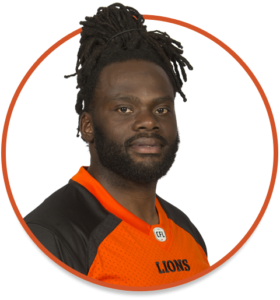 The road to redemption for Adrian Tracy as a person and as a football player runs through the streets of the city of Hamilton, Ontario. It is here that the Ticats’ rush end has learned about human kindness, faith, love, hockey and, yes, football ‘Oskee Wee Wee’ style. 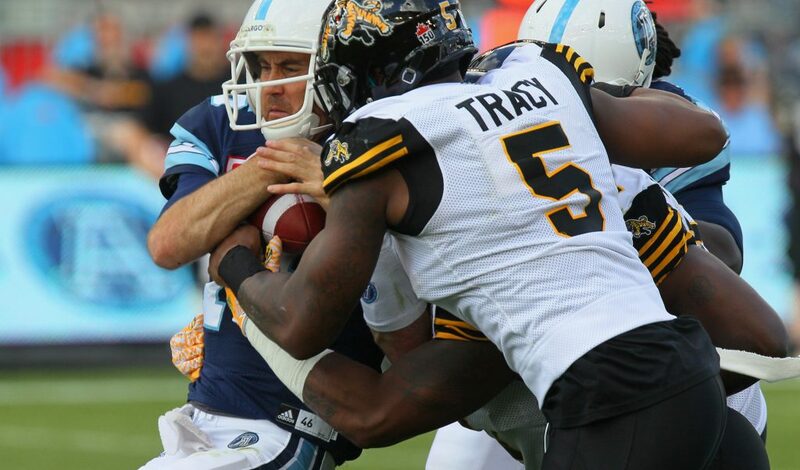 Now in his third full season with the Ticats, the 31-year-old native of Fairfax, Virginia has become a key component on and off the field, living year-round in Hamilton and giving willingly to a team and a community that has given so much to him since he was signed in December, 2014. He had been released by the Arizona Cardinals before the start of the 2014 National Football League regular season. 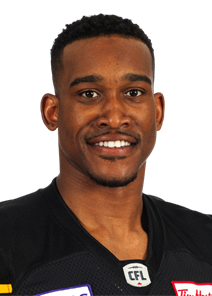 Prior to that, he had been with the New York Giants, who selected him in the sixth round, 184th overall, out of the College of William and Mary in 2010. 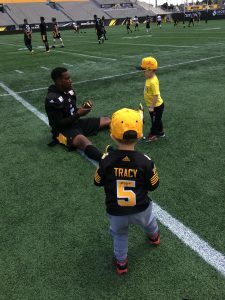 His first introduction to the kindness of the community came before he played a single down for the Ticats. He was walking down a street on his way to breakfast. Two strangers were going in the opposite direction and one, who noticed Adrian hanging his head, asked how he was doing. 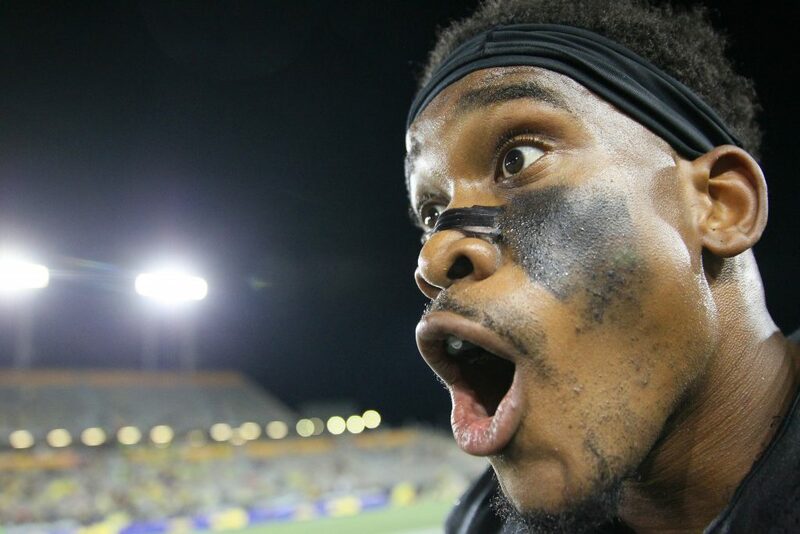 Adrian was not wearing anything to suggest he was with the Ticats, so he was caught off guard. He then realized someone was simply trying to be nice. “To feel like I was somebody in a place that nobody knew me felt very important,” he said. “It was just a good feeling when I got here. It felt right. I ended up staying and here we are, more than three years later. From that standpoint where people are just extending a hand to see you smile, that’s what was important to me. 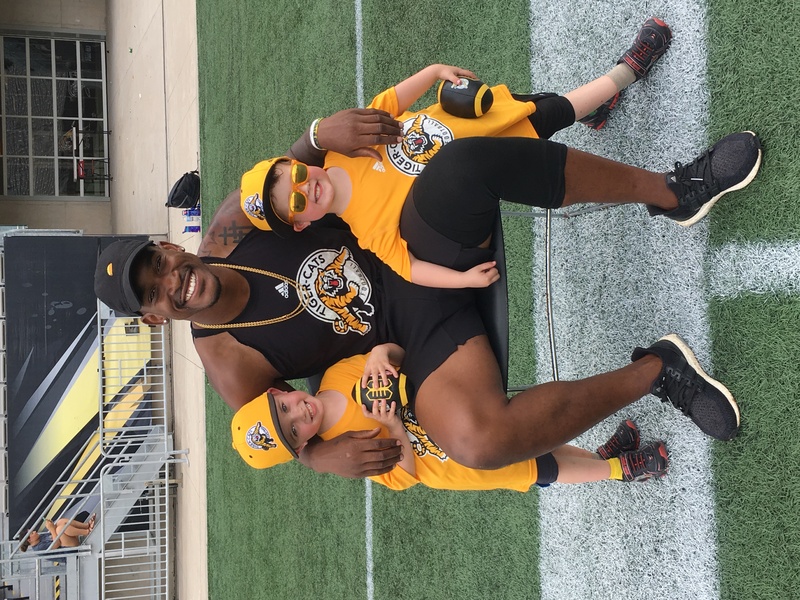 After playing six games in 2015, the Ticats signed him to a contract extension, which he said gave him a boost of confidence as far as the team recognizing him as a person who could contribute to the organization. He decided to live in Hamilton year-round. “It was good on a professional level and also for my personal life … [It helped with] what I wanted to do as far as giving back to the community and getting people to see me as a person, more than just as a player with a helmet on,” he said. One of the first things he did was turn a diehard Toronto Argonauts’ fan, Ania Kraguljac, into a Ticats’ fan. 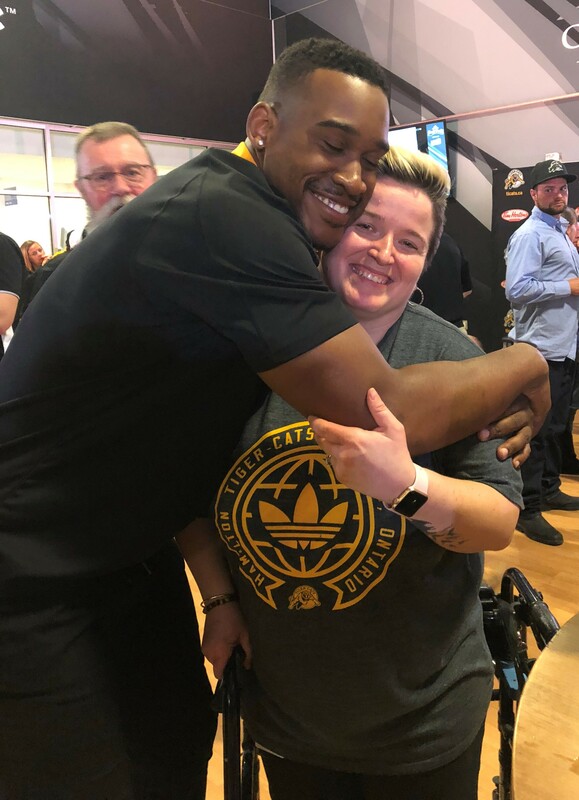 Ania happened to be at the Ticats’ 2016 Draft party function with a friend and was wearing an Argonauts T-shirt because she wanted to stand out. Adrian saw her and jokingly tried to cover up the Double Blue logo with a football. 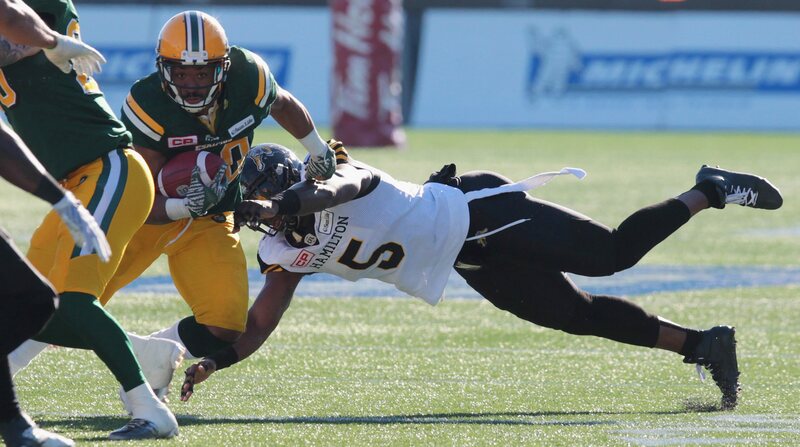 Ania said Adrian reminds her of Argos’ great – Mike (Pinball) Clemons, coincidently, another William and Mary grad. 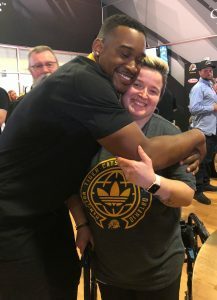 “If you are around Pinball, the day gets better and Adrian is the same way,” Ania said. 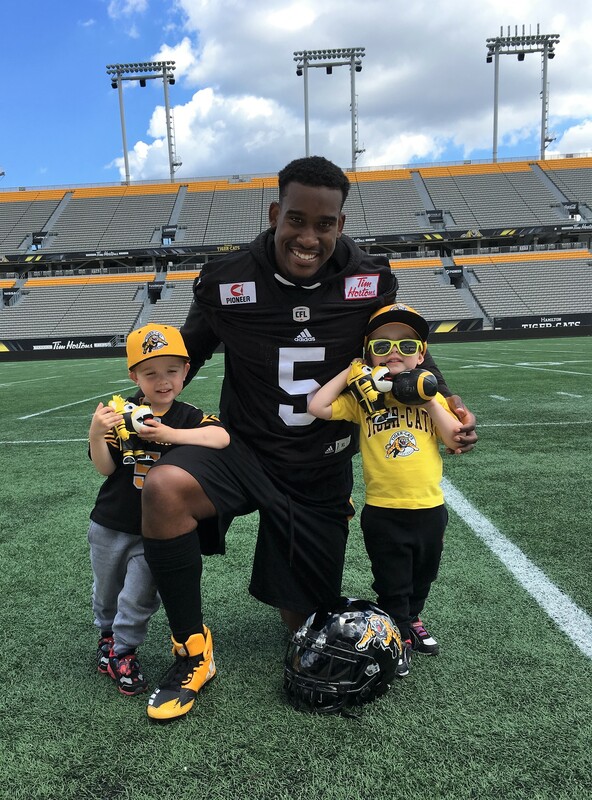 Adrian, who is one of the Ticats’ CFLPA player reps, said it’s become a dream come true to see fans wearing his jersey number. He originally wore number 93, which he said was “awful,” but switched to 5 when rush end Justin Hickman joined the Argos in 2016. “I was doing some research because I’m a believer in God and one thing five meant is a sign of grace, favour and mercy, and those three words describe my past through football this far,” he said. “In every situation I’ve been in, I’ve been the underdog. 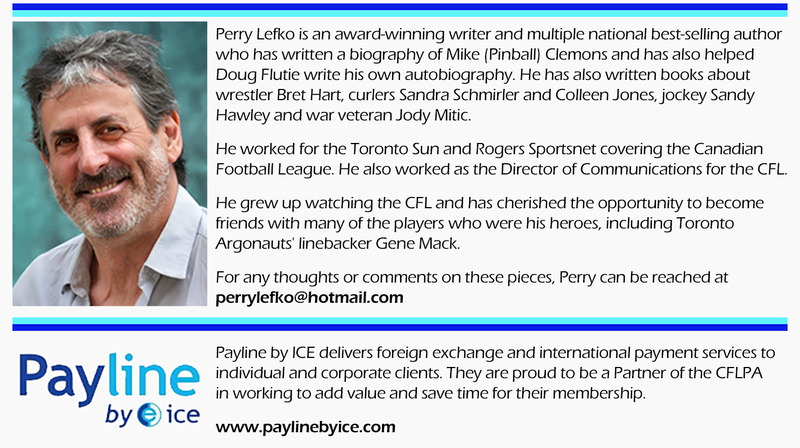 I walked on to my university team – the university was known for academics not athletics – so for me to get drafted from there by the NFL and go to New York, that in and of itself was a great accomplishment. I had to carve my niche out slowly but surely there [New York], among my (defensive line) teammates are: Justin Tuck, Osi Umenyiora, Mathias Kiwanuka and Jason Pierre-Paul…Those guys are first-rounders, Pro Bowlers, potential future Hall of Famers. 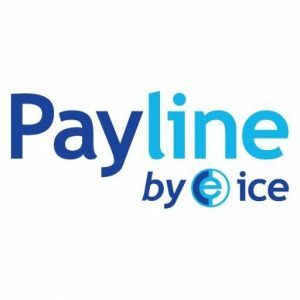 It made me feel that even though things weren’t working out the way I thought they should, I’m here for a reason and I have slight favour in their eyes … I definitely had grace to get to that point. “The mercy aspect came when I got released from New York. I self-identified as being just a football player. I thought when that was taken away from me, that I didn’t have a true identity, even with my family. Not that they wouldn’t love me, but I was in a position where I could be a super bread-winner for everybody. That was something I wanted to do growing up – just take care of my family – and I didn’t have the means to do that anymore and that kind of set me back. He said what happened to him became a short lesson on life. “That’s the mercy aspect of it,” he said. “I could have easily been in the situation where you hear of players in the NFL who get released and feel the only thing left to do is end their lives. I’m not saying that I was ever in that boat, but being in a dark, depressed state and feeling like those emotions were getting stronger, I can definitely relate. One of the things he has done without much fanfare is embrace twin five-year-old boys, Jackson and Brady DeHart. Adrian met the boys in May 2016 at McMaster Children’s Hospital, which was having an official ceremony to open up its courtyard. 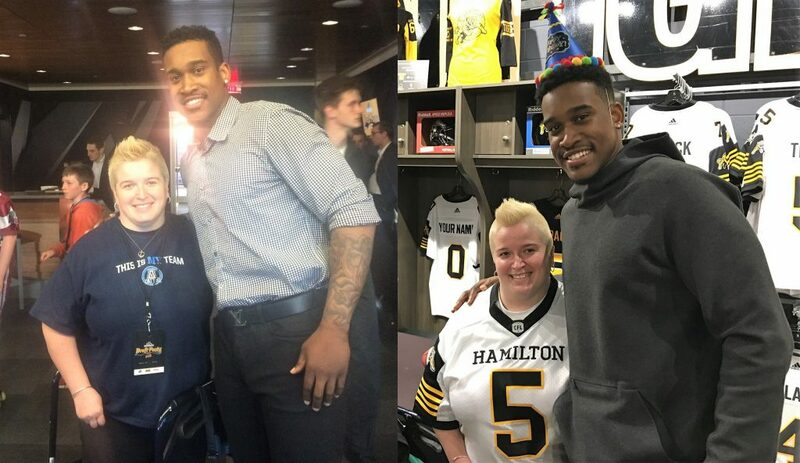 Some Ticats’ players attended the event. The two boys were there because Jackson, who has leukemia, was undergoing a bone-density scan. Adrian saw the two boys sitting off by themselves and how one was looking after the other and it reminded him of the bond he and his brother have. “I hadn’t seen my family for about a year and a half, so seeing those two – I just naturally gravitated to them and started playing with them,” he recalled. 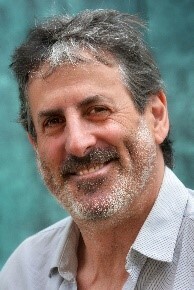 “We ended up spending the rest of my visit there just playing and talking and getting to know each other a little bit. The hospital asked for permission from the parents of all of the children to post photos of the event to its social media page. Adrian just happened to be participating in a stair climb for cancer the next day at Tim Horton’s Field and dedicated it to the twins he’d just met. The boys’ mother, Laura, didn’t know anything about Adrian. The DeHart family live about half an hour away from Hamilton (in Milton) and didn’t follow the Ticats. Laura started a Twitter account and privately contacted Adrian. He messaged her back saying he was doing an autograph signing and the family should join him. It became the start of a special relationship. The two boys began going to Ticats’ practices, where Adrian plays catch with them. “The kids just hit it off with him from the moment they met him,” Laura said. “Adrian is an amazing man. He treats our kids like they are family. They love him. They always say ‘Adrian is our best friend and he’s part of our family.’ It’s what they say any time anyone asks who he is because they’ve got pictures with him. Definitely… I would say he’s a hero to them. 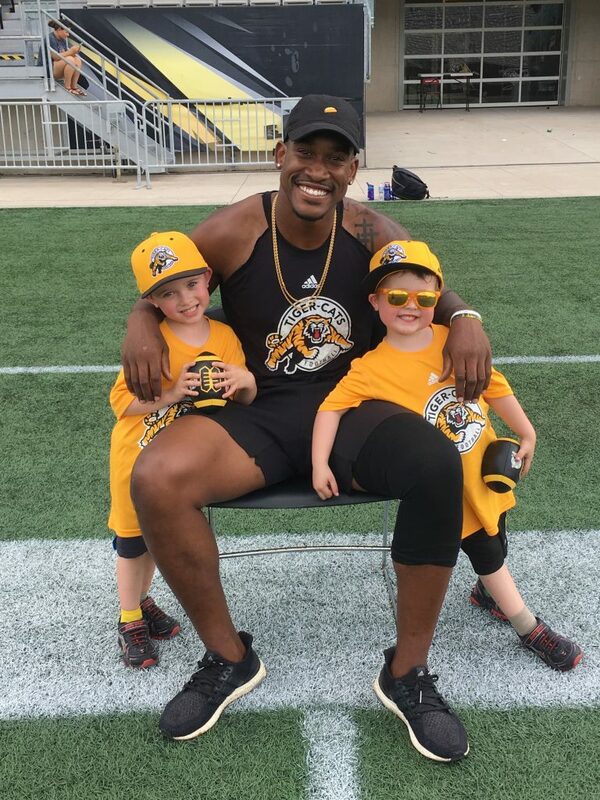 They’re still a bit young to understand the fame, but they get all excited when they see him on TV when the Ticats are playing and they show the starting lineups. I think they have a basic understanding, but they are not quite old enough to appreciate it. “Sometimes they want to send silly little messages to him and he always answers them back and sends them little videos,” Laura added. “It brightens their day, it brings up their spirits. It’s been nice because Brady kind of gets left out a lot. Adrian is someone who he can play around with roughhousing. When Jackson is really sick he just has to sit there. We spend a lot of time trying to help him, so it’s been nice for Brady to have something special for him. “Now that Jackson is a bit healthier, he joins in the action. It was just a chance meeting Adrian, and he really made a huge difference. It’s helped Jackson want to do more active things because he was pretty sedentary for quite a while. [Now] he wants to get up and move so he can go play with Adrian. He wants to be out there on the field. He wants to throw, he wants to run. Adrian bought the twins Ticats’ jerseys with his number and name and personally autographed them. The DeHarts have since bought them new ones because they outgrew the other ones. Ken DeHart said it means so much to have a professional athlete, and one who is high-profile in Hamilton, develop a relationship with his boys. Laura said Adrian is impressive because of what he does without seeking publicity. Hamilton has truly been good for Adrian. He has become a huge fan of the Hamilton Bulldogs of the Ontario Hockey League. He also started dating Toronto-based broadcaster Kayla-Marie Williams, who used to work for the Ticats TV. And he supports a clothing apparel company, True Hamiltonian, because of what it represents. 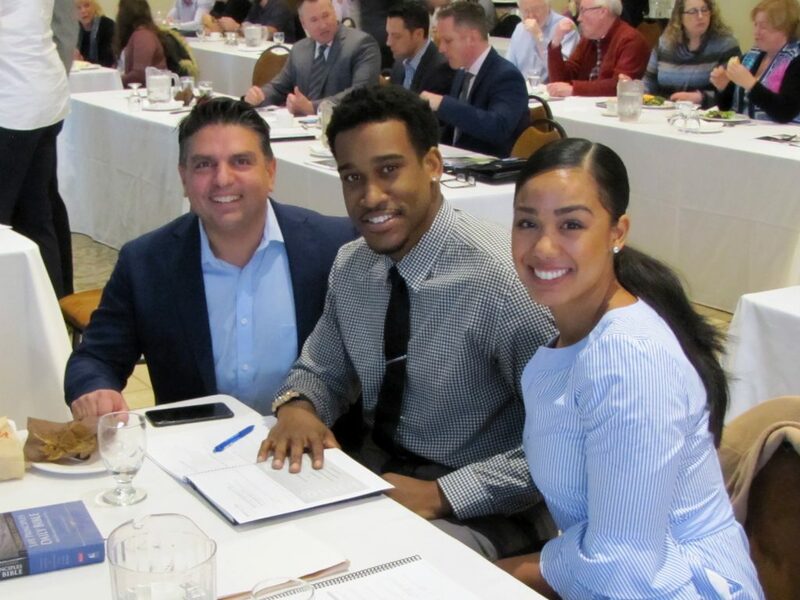 Adrian and Kayla-Marie Williams attending a Wealth Mastery Bootcamp hosted by Todd Peterson and the fantastic team at Enriched Academy! 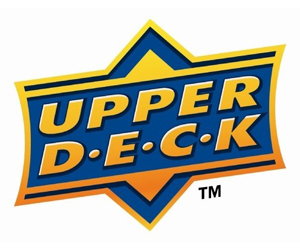 NEW 2018 Upper Deck CFL Cards!